Monk: So three Fridays in a row hitting up barbecue spots. Is this becoming our weekly date night, Speedy? Speedy: I guess so, Monk. And with three dates in the books, that makes you my longest relationship in years. I guess good ‘cue really keeps people together. But enough with the sappy stuff – let’s talk about the food. 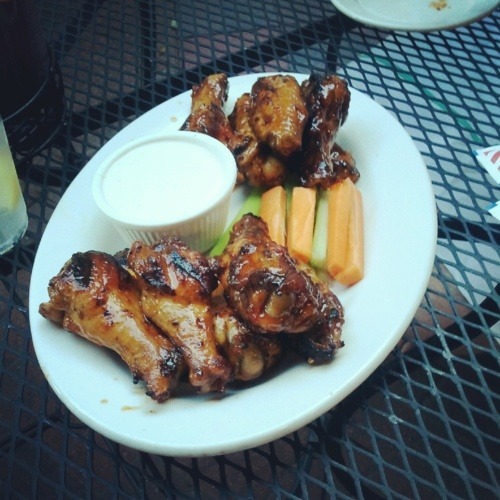 Speedy: …so Monk and I took advantage by ordering some wings for the cost of on the house. We ordered two flavors – PoPo (which is the house rib sauce) and chipotle apricot. The wings had good flavor, but I feel they could have used some dry rub of some sort prior to smoking. They were big and meaty and overall a great appetizer. Monk: The pork had some nice bark on it, but was maybe a bit dry and required the use of one of the four sauces available on each table – Eastern NC Sauce, PoPo’s Sauce, Queen City Q Sauce, and SC mustard. Once sauce was added the pork was much better. Tellingly, the SC mustard sauce was the only one of the four that either Speedy or I didn’t try. Speaking of sauce, the brisket was slathered in it and unfortunately was the consensus lowlight of the meal. While a decent mix of fatty and lean, it seemed a bit overdone. Rudy: That can always be a sign of bad brisket. If it is done right it doesn’t need much, if any, sauce. Whenever I see a place smother their brisket with sauce, I figure they are throwing in the towel. Speedy: The ribs, on the other hand, were cooked perfectly. Great texture and flavor, they’re done St. Louis style with the sweet PoPo sauce. 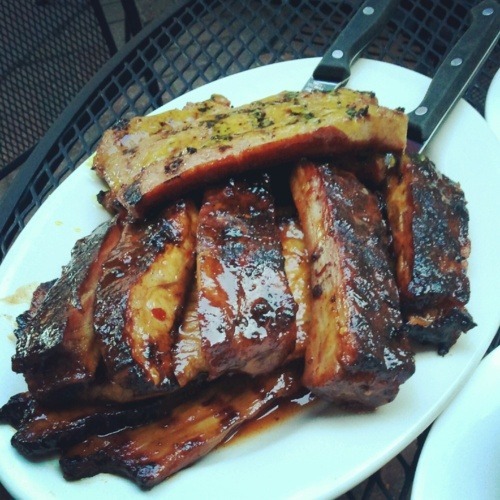 While they were very good, I’ve learned over the years that I generally prefer Memphis style ribs with dry rub, as the sweetness of St. Louis style can be a little much. I think that was the case here, though it didn’t stop me from eating several bones. The only thing on the plate that Monk and I finished completely was the sausage – and with good reason. It was served split and with a mustardy sauce. I’m assuming this was their SC mustard sauce, which to me, is only appropriate on sausage. But the flavor and texture were great. It definitely ranked among the top sausage I’ve had. 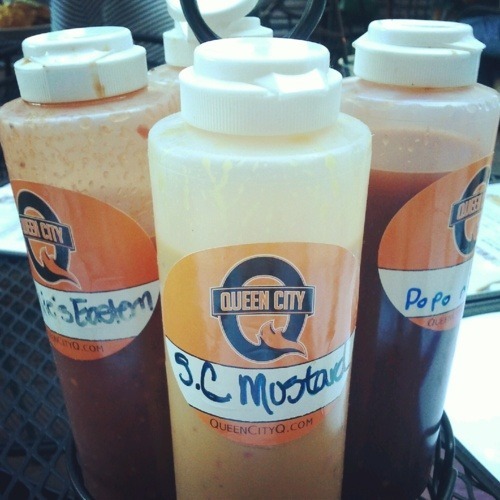 And thankfully, Queen City Q has actual BBQ slaw on the menu that is really well done. It’s properly chopped and has really solid flavor with just a bit of spiciness. 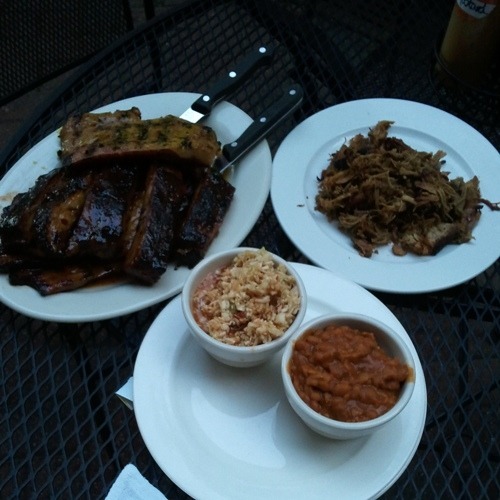 Monk: Perhaps I’m a bit of a nancy, but the BBQ slaw was a little too spicy for me – still a welcome menu item though. Queen City Q has an abundance of sides, and I was slightly tempted to order the “Asian slaw” but I wasn’t sure whether or not it contained mayonnaise and didn’t want to face Speedy’s wrath. In the end, I went with their baked beans with Neese’s Sausage BECAUSE HOLY HELL IT HAS NEESE’S SAUSAGE IN IT OF COURSE I’M GOING TO ORDER IT. One thing that always gets our collective goat is if a restaurant lacks hush puppies, and unfortunately this is the case for Queen City Q. Sad, really, because otherwise this is a very solid barbecue restaurant all around. Rudy: The last few places you guys have tried have had lots of different types of barbecue. The positive is that they have several for you to try, but the negative is that they don’t really have a specialty. Do you think that a restaurant would be better served to have a single specialty that they master or to offer variety that is all above average? Monk: Good question…I can only speculate as to the reasoning why that is the case. If you are a new barbecue spot opening up, then I’ve noticed that the tendency is to go for “barbecue fusion” and have several types of meat cooked in the style of different regions. I would welcome a restaurant focusing on one specialty *COUGHGOODLEXINGTONBARBECUEINCHARLOTTECOUGH* and executing the crap out of it but I don’t really see it happening anytime soon. Speedy: Another nice bonus was that all NC beers were $3. The restaurant has a nice variety of brews on draft and does a really good job of supporting local brews. The restaurant itself has a couple of bars and good TVs for watching sports. 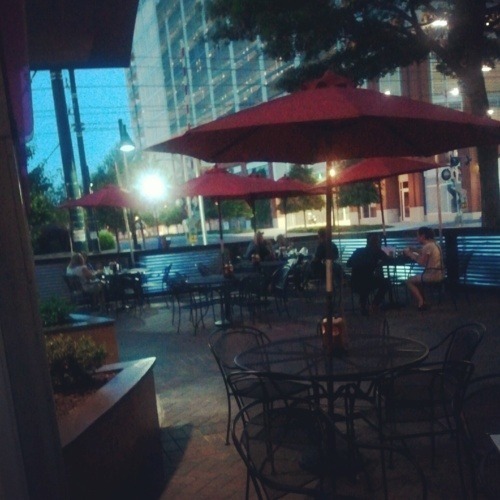 That makes it a great spot to go watch a game or eat before a Bobcats game. Monk: I agree that it is a good spot to watch sports (some folks were taking in the US vs. Antigua and Barbuda World Cup qualifier the night we stopped in), but let’s get serious Speedy – you are the only one who actually goes to Bobcats games. Monk: So I think the consensus between the two of us is that Queen City Q and Midwood Smokehouse are our two favorite barbecue spots in Charlotte, right? Which is a little odd, considering they are two of the newer places – Midwood opening in 2011 and Queen City Q just earlier this year. But I think this is more of a case of the newer places doing barbecue properly, as opposed to any riot against the old on our part. Speedy: That’s right, Monk. Both places did a great job creating their menus to highlight several different styles of barbecue. And while I’ll always be a chopped pork kind of guy thanks to being reared on Lexington Barbecue, it’s nice to have all of these options available. 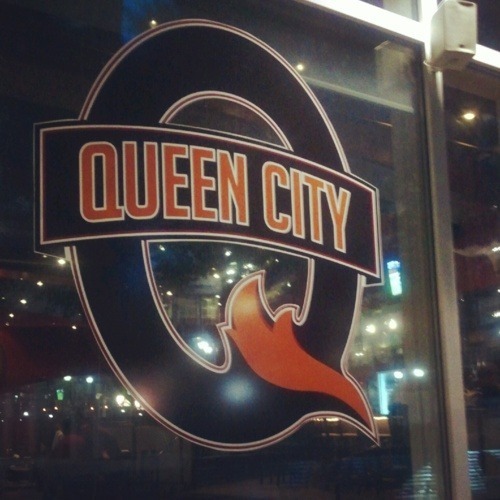 Thanks to the good food and great location, Queen City Q will definitely continue to be a Charlotte staple for me.